As shown previously on The Old Motor, the automobile has been shipped all over the world since shortly after it was first produced. 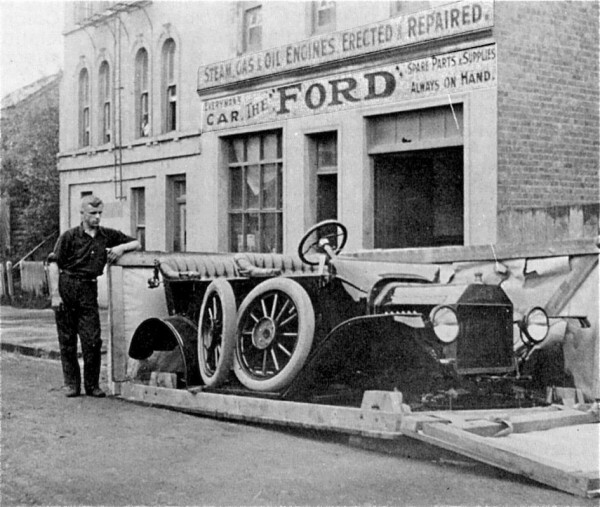 This photo taken in New Zealand circa 1914 or 1915, shows a Model “T” Ford of Canadian manufacture, after shipment to a Ford Dealer. Note the interesting signage announcing the stationary engines also offered. Photo posted by Erich Bruckner on the MTFCA Forum. “The cars arrived at the garage packed just as they left the Canadian factory of the Ford Company. 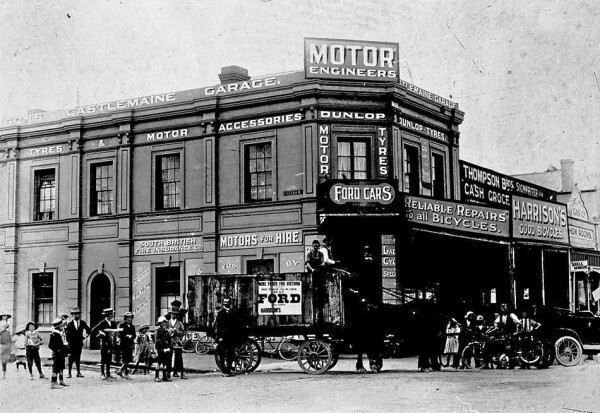 Popular opinion is that motor-cars from overseas arrive in Australia in parts, and that these parts have to be unpacked and assembled before the car is ready for use. Instead of this being the case, however, there is very little assembling to be done. Each car body (with engine, axles, steering gear, and lighting plant and fittings, all complete and in place), is boxed up in a packing case of very strong timber”. “The Wheels are detached and fastened to the inside of the case, and the hood is strapped over the engine. The only other parts of any importance that are not in their proper places are the glass wind-screens and the steering wheel, and these are strapped to the upholstered seats. When the top, ends and sides of the packing case are removed the body is packed up and the wheels, etc., put into place in a very short time. All of these cars have come for fulfillment of orders received”. This entry was posted in Auto photos 1885 - 1920 and tagged Ford dealer, Model T Ford, New Zealand, stationary engines. The New Zealand picture above looks to be quite early – 1914 maybe? I think by the 1920s in New Zealand the cars were arriving in parts and being assembled. Almost every large town had a Ford T assembly facility, even if only for a few years. The depression slowed sales of all cars and from then all of NZ’s Fords were assembled at the Colonial Motors plant near Wellington. Mark, The Model T experts believe that was built no later then 1915. The top picture is a 1915 Model T. There are several features which are specific to the 1915 model, most importantly the firewall, rear fenders and the headlamps. Could be 1916. Henry has new body here and still using up the smaller hood and brass radiator. Till sapped. And electric head lights. I would think this was early 1916 , electric head lights.